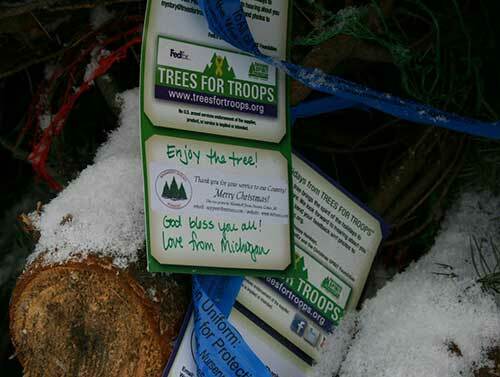 Since 2005, Michigan's Christmas tree growers have donated more than 1,000 trees each year to support the Trees for Troops program. Imagine a smiling group of U.S. troops gathered around a Christmas Tree that was grown on an American farm and express shipped to arrive fresh and green somewhere on the other side of the world, just in time for Christmas. Or, imagine a spouse and children sharing joyous memories of Christmas through the gift of free, real Christmas Tree while their family member is away serving our country. Trees for Troops® makes this vision a reality! Trees for Troops counts on donations from the public to make this program succeed, and our fundraising drive for Trees for Troops 2015 is in full force. You can support Trees for Troops through your tax-deductible donation or by becoming sponsor. The Christmas SPIRIT Foundation is a 501(c)(3) public charity. Your tax-deductible charitable contribution will help those in service to their country and their families receive a Real Christmas Tree and keep the spirit of a traditional Christmas celebration alive. Since 2005, Trees for Troops has provided more than 157,000 Christmas Trees to military families and troops in the United States and overseas.